The news came from Call of Duty. After the huge succession of Player Unknown Battleground (PUBG) both in Android as well as PC, The Tencent company is now all set to launch call of duty : Legend of war on Mobile . Isn't a great news ? But there is a little caveat. The Game is coming on Android smartphone with Alpha version. Because the Tencent comapny apparently wants to work on some improvement of the app before rolling out a stable version. Call of Duty is a first persion shooter video game francise. The series began on microsoft windows and expected to console and handleds. Several Spin off game have been released. The earlier games in the sereies are set primarily in WorldWar ll . But later the game typically been set in mordern times or in futuristic settings. The most recent game Call of Duty :Black ops 4 was released on 12 october, 2018. In an event the Compnay Tencent says that Call of Duty: legends of war comes with the best combination of popular best maps, Characters, Weapons as well as Gears from the Call of Duty universe for the first time in one game. • Multiplayer Mode : Where players will be able to engage in online 5v5 PvP action with modes such as Team deathmatch, frontline and others. • There is also be Zombie mode in the game. • Options to use Classic Call of Duty map which will include Nuketown , Crash, and highjack. • Characters will be same as Call of Duty :Mordern warfare as well as Call of Duty : Ghost. • In the Android app players will be able to earn Perks, Weapons, Skills, as well as Equipments from supply. • The Game comes with FPS touch control specially developed for mobile controls. • Customizable HUD and settings. • AAA quality console graphics and 3D graphics. After done this process you can play and enjoy the game . 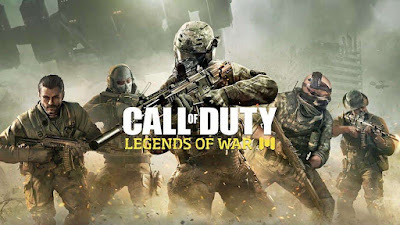 If u find this article helpfull don't forget to tell us on comment sections and share to your friend who is addicted to Call of Duty :Legends of War to play on android. Tovget more latest updates like this you can connect with us on Facebook, Twitter or Google+. Thank you for been here !